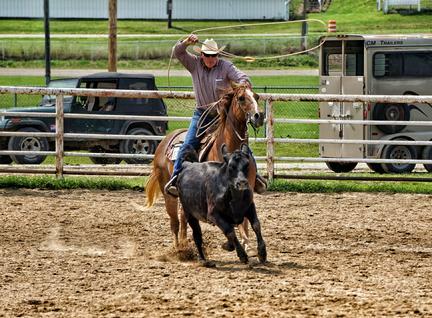 OFQHA hosts 5 shows per year focused on preserving the western lifestyle and promoting ranch style riding. We always welcome new members! As our name implies we enjoy showing off the foundation quarter horse but we are a family friendly ALL BREED show. There are classes for everyone from adult to youth in walk/trot, trail, reining and cutting. You do NOT have to own a quarter horse to show with us. These shows are great for all levels. We have members that only focus on our shows, members that use this show to tune-up for bigger shows, and members that use this show to keep their trail horse sharp. You must become a member of OFQHA to show (our membership rates are very reasonable) and complete 2 hours of volunteer work per season to be eligible for year end prizes. Ribbons are awarded at the shows. There is great food on site (thanks Ron & Shirley), campsites with full service (electric and water), full restrooms with showers, bleachers for your family, and a stall for your horse. Thanks for visiting our web site! If you have additional questions or would like a mentor to get started please visit our contacts page. Hope to see you at the next show season! American Quarter Horse Association - Your involvement with the American Quarter Horse will be exciting, and I am certain you will get the most out of your membership with AQHA. In addition to providing the core services of registrations and transfers, we will unveil new programs designed to enhance your involvement with your American Quarter Horses and give you more for your membership dollar. As a matter of fact, a membership can quickly translate into nearly $350 in value through AQHA and its corporate partners. The National Foundation Quarter Horse Association - Located in gorgeous Wallowa County, Oregon, NFQHA was formed in 1995 and is a full service horse breed association dedicated to preserving and promoting the National Foundation Quarter Horse, while working to retain the original Quarter Horse breed characteristics as described by AQHA founder, Robert Denhardt. As of Dec 1st, 2008 NFQHA received 32,546 Research / Certification applications and has 13,133 household memberships. (One membership covers all family members at the same address). NFQHA has members in all 50 states plus 28 foreign countries. American Ranch Horse Association - The American Ranch Horse Association is a national association that offers a family oriented, friendly competitive atmosphere for those that are dedicated to the true versatile ranch type horse. The ARHA is open to all western stock-quarter type breeds, whether ridden on the ranch, on the trail or in the show ring. The National Reining Horse Association, the international governing body for the sport of reining, is a nonprofit association dedicated to promoting and encouraging the development of and public interest in the sport of reining. The focus is on developing and maintaining suitable standards of performance and judging and in providing a fun filled, family-oriented atmosphere. Equine Affaire, Inc. was established in 1993 to create a first-class, education-oriented horsemen's convention that would be second-to-none. The mission of Equine Affaire, Inc. is to produce events designed to: Improve the horse management, training, and riding skills of current horsemen, promote communication and cooperation within our very diverse national horse industry, provide an introduction to the extraordinary world of horses and showcase the finest horses and riders representing a variety of horse breeds and equestrian disciplines. equine.com - 2.7 Million Visitors Online, 55,000 Horses For Sale and 260 Horse Breeds. Ohiorcha.com An affiliate of the National Reined Cow Horse Assoc. For Show schedules and more information visit the web site.